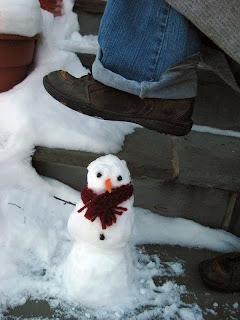 My friend and roommate Teri Jo happened to babysit Rachel's friend, so they came over for a play date with the hopes of making a snowman. We then figured out that although the day was sunny, the snow was unfortunately quite powdery, so Teri suggested we make miniature snowmen. We went in to the kitchen to get baby carrots and raisins, and the product was adorable. Then I remembered how I had promised to make some small projects for my blog, so I set to work on making tiny crocheted scarves for the two mini snowmen we made. 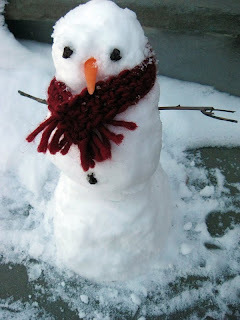 Snowmen have no necks, however, so they turned out to be a little short. They are quite cute, though! All was fine and good until the one on the left decided to have an opinion about Teri's footwear. She asked her mom for snow-boots, alright?